If only I had heeded this advice when I was young, then I wouldn't be in the state I am in now. Damn my habitual snacking.... I'm off to the gym to regain my youthful slimness! 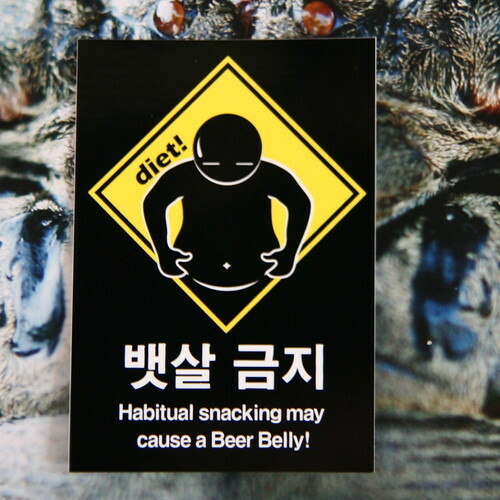 뱃살 금지 means "Belly Fat is Prohibited." Hi, Paul! Found you through koreanbloglist, and am enjoying reading your past posts. 뱃살 금지 mean, literally, belly fat prohibited, which I find hilarious. I totally want some of these stickers (the panda one is great, too)! Thanks Jeanny, I thought it was "belly fat" but my computer dictionary said otherwise. Thanks for the correction! Those computer dictionaries! Don't listen to them, they lie.